The last couple of years, I feel like I have been on an incredible journey. God has led me to lead some Bible Studies with Sam Nesbitt. We have done Believing God, Jesus, the One and Only, and one on the Fruit of the Spirit. As part of Branch Counseling I have held seminars about stress, anger, loneliness and self-esteem. God then led me to do a series called “My body, God’s Temple”. There were four sessions on the brain and controlling our thought life, one on the physical which includes exercise, sleep etc, another on nutrition & what we eat and one on spirituality. God has been really active in teaching me about having a balanced life and how to take care of myself. As a result of this information that spring, I have started to apply these principals in my own life. I have been watching what I eat, exercising, being conscious that I am getting enough sleep and watching overall stress level. Since then I have felt so much better. This has made a huge impact in my physical well-being. One thing I have learned is that God has a plan for us regardless of what we go through. Everything I experience I can use to help others in their journey in life. I believe that God wants us to be the best we can be and give him all the glory. I want to help you be the best you can be and to give you hope. Update 2017 As I continue to grow in the health areas, I read a book that talks of trauma of childhood and how it affects our health as an adult. It was truly an amazing thought which really makes sense to me. But the book didn’t really give answers that were biblical based. 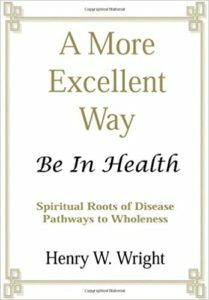 As I was sharing this, a friend of mine gave me this book A MORE EXCELLENT WAY – Be in Health by Dr. Henry W. Wright. I am thrilled with the concept and I love the fact that there is so much written Word of God in it. My postings from November on will reflect my thoughts on this book.